The lone arresting highway patrol officer keeps responding to our reassurances that we are non-violent with the fact that we are also non-compliant. He is right, we are not compliant with war, with drones, with the occupation of another's country for our corporate gain. 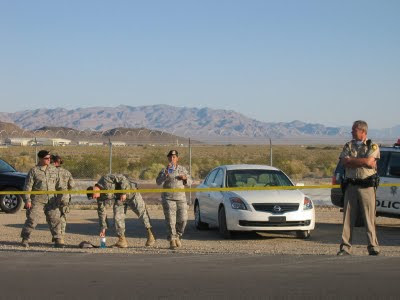 Two white military soldiers, very young, very small, very lost, stand in front of the gate holding automatic rifles, dressed in long sleeved uniforms with pants tucked into tall black boots, and several other weapons attached to their belts. 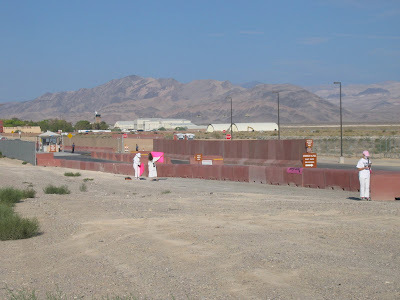 One young man stays with us as we are moved behind a barrier, across the frontage road to the base, and cut off visually from the rest of our group of protesters. I ask him many questions that he says he cannot answer. He does answer a few, like he has been in the military for 3 years and he's not from Nevada, he's been to Iraq. He has two little stripes and sweat pours down his face as he shifts his weight from foot to foot. I wonder outloud if he would be willing to kill us too should his commanding officer order it. He cannot answer but he looks startled. Another highway patrol officer has landed and this one not at all as nice as the first one. He grabs one of the men, takes him to the side of the barricade, and handcuffs him behind his back. We protest to no avail. Soon a couple of other officers show up with the paddy wagon. We are all given tickets and then handcuffed. Several other military soldiers show up. I begin to read the open letter to them as I try to give them a copy. The officers then move quickly to place us inside the paddywagon, non-violent but vocal and non-compliant! 4 o'clock we return to Creech AFB to greet the soldiers leaving the base for the day. We continue to attempt to hand them this open letter. About 20 or so have come to join us, including several from Pace E Bene. Seven of us are committed to attempting to meet with the base commander to talk with him about this letter and about the drones. Seven of us are so determined to meet with him we are willing to risk arrest. We are arrested shortly after approaching the gate. We know that you, as is true for all soldiers around the world, have chosen to willing put your body and mind in harms way if need be; that you have chosen to risk severe injury, even death; that you are willing to make the ultimate sacrifice of your life for all you believe in. We are here today to ask you to seriously and sincerely consider those women, children, babies, and men who have not made those choices; who are not soldiers; who are like us, civilians. We ask you to refuse to press those buttons that kill women and children 7000 miles across the world. We know that you and many people in this country believe you are heroes. 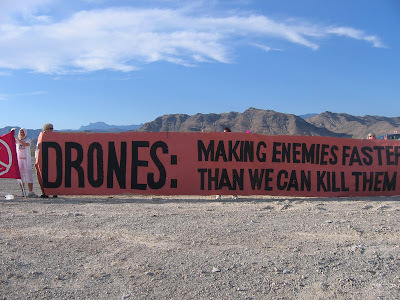 We ask you to be the real hero who refuses to drone; refuses to hunt human beings down and assassinate them; refuses to cause death, destruction, terrible wounds to so many other human beings. We stand in solidarity with those women, children and men from Pakistan, Iraq, and Afghanistan who are suffering from these drone attacks; we stand in solidarity with your children, mothers, families who may be the victims of drone attacks in the future if we don’t stop this warfare from space. Dawn to Dusk - arrested for walking the wrong way on the street???? 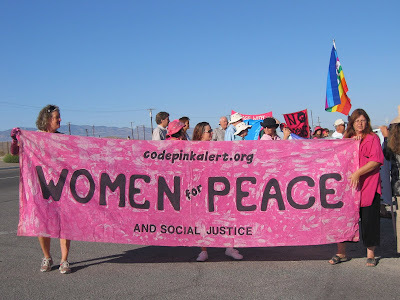 First thing this morning, one of our crones Leeza attempted to take a photo of a banner at the action outside of Creech air force base. 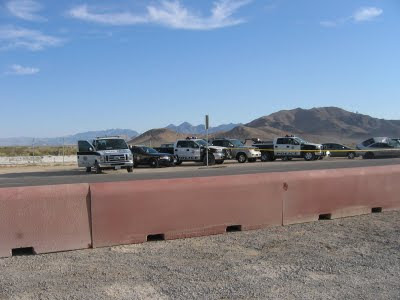 30 activists descended upon this desolate row of low brown buildings behind barbed wire link fences in the middle of the amazing Mojave Desert. 5 police officers marched in formation across the road to surround and arrest this 72 year old woman as she bent over her camera examining the picture she just took. Toby, who was standing next to Leeza, asked the police why were they grabbing Leeza. Another 5 officers swiftly proceeded to grab this other extremely threatening woman who dared to ask what they were doing to her friend and arrest Toby also. Both women were taken to one of the paddy wagons ready to hold the non-violent peace makers. 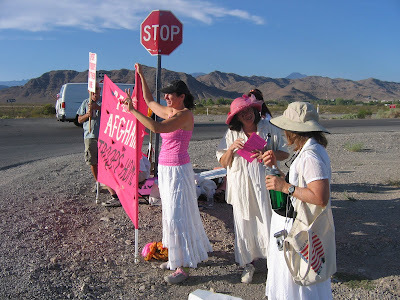 After an hour of bannering, chanting, singing for the release of the detainees, Leeza was cited and released, leaving Toby in the wagon by herself. Lisa courageously and in sister solidarity, walked across the road and was immediately arrested as well. 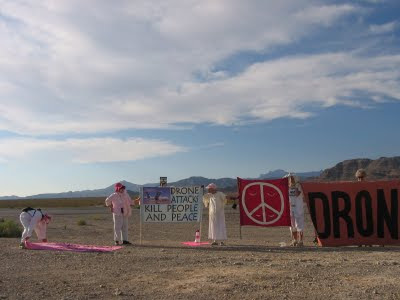 Demonstrators continued the action, holding up a huge "DRONES: Making terrorists faster than we can kill them" banner, attempting to dialogue with the soldiers entering and leaving the base. 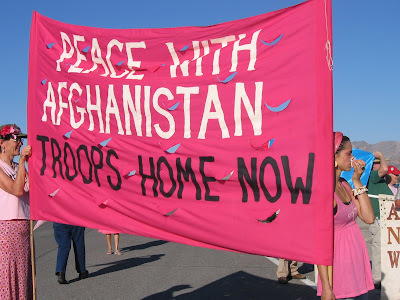 Edwina walked across the street to hand out flyers to soldiers on the other side of the road. When she returned across the street, 4 zombie police tumbled out of their police van, crossing the road behind her, gaining slowly on her to surround her and arrest her as well. 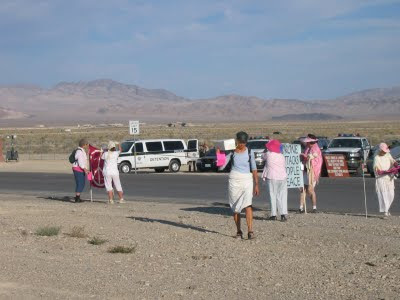 Apparently in Nevada it is illegal to walk on the highway unless you are facing the oncoming traffic. Little did Edwina - or any of us - know. 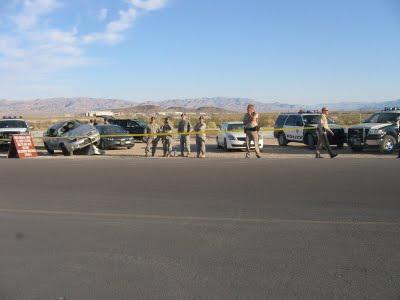 So four of us were arrested this morning - unplanned arrest. We're heading to the 4:00 action and civil disobedience. Women circled coffins of babies and wailed for the dead and wounded, especially the babies.